Newton Design & Marketing Blog - Page 31 of 103 - Strategically Creative. Creatively Strategic. Page URLs and directories can be edited easily and renamed to include targeted, high-performing keywords. Vanity URLs: You can set vanity or branded URLs (e.g., yourdomain.com/MarketingCampaign) that are shorter, more user friendly and have the added bonus of being SEO friendly. 301 redirects are a snap: Sitefinity makes it easy to set up a 301 redirect (permanent redirect) from an old URL to a new URL. This ensures Google will continue to follow your links. SEO tag fields are easy to use: In a single screen, Sitefinity developers or SEO strategists can input title tags, meta descriptions, meta keywords and header tags. There is even a basic built-in spell check feature to keep you honest and your English teacher proud. Keyword-rich image tags: Sitefinity templates make it easy to add/edit ALT tags to appeal to search engines (and, of course, assist screen readers and the overall user experience). Descriptive link tags: Setting up links to your own content and others’ is critical to enhancing your search engine credibility and ranking. 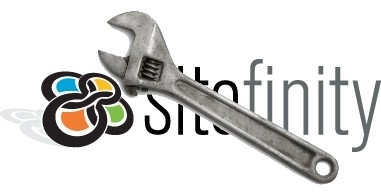 Sitefinity’s user friendly link tool allows you to easily add and edit links to your own in-site content or others’. Clean back-end code: Sitefinity’s out-of-the-box back-end code is compliant with SEO best practices, which makes your job a lot easier from the get-go. You also have the ability to add your own code, but make sure your developers are familiar with the “do’s and don’ts” of SEO. Block pages from search: Sometimes you have a page you don’t want a search engine to scan or that won’t have any search engine value, such as a form confirmation page. Sitefinity offers a built-in ability to block pages from being crawled by simply checking a box. Manage social property content: With the recent search engine algorithm updates (e.g, Google’s Penguin and Panda updates), your search engine marketing strategy demands valuable, sharable content. Sitefinity’s ability to publish content and integrate it with your social media properties greatly improves your SEO. Publish your content to Facebook or Twitter, or manage a blog, all from one CMS. Responsive design: Sitefinity is one of the only CMS’s that incorporates responsive design into the content management experience. Designing your site responsively means your site fluidly adapts to all devices and platforms at all times. This is great for user experience and SEO. How? Well, Google just happens to love responsive design and recommends it because it allows for a single URL for your site (read: increased traffic for your URLS = increased credibility to Google). It’s crucial to work with a web design/development firm that understands SEO so that SEO is a primary component from the beginning of the design. A beautiful site is not necessarily an SEO-friendly site. Choose your vendor wisely. The content on your pages is critical to improving your search engine ranking, so enhance your site with valuable, fresh content – all of the time. Michelle Brown is Director of Marketing for ZAG Interactive, a full-service web development firm based in Connecticut. ZAG Interactive offers website design, development, marketing, and strategic services to clients nationwide. Three local women’s business associations have come together in spirit to host a premier event for professional women and men. The Women’s Council of Realtors, Montgomery County Association of Business Women, and Multiple Chapters of WOAMTEC (Women On A Mission To Earn Commission) invite you to join us on October 16th, 2013 from 9 am – 3 pm for The WISE conference. This conference is designed to Inspire, Support, and Empower in a fun, upbeat networking environment. It will cater to anyone with a desire to learn more about work-life balance through motivational speakers and educational demonstrations as well as a little pampering and shopping along the way. And of course awesome door prizes! Proceeds from this year’s conference will support two local non-profit organizations, IGoPink, a division of Breast Cancer Charities of America, and The American Cancer Society. Please join us at The Woodlands Resort and Conference Center in supporting our local business owners and let’s help each other live a balance, fun filled life!